In my house, whether I am in North America or Italy, lunch usually is a big bowl of vegetable soup enriched with beans or grains, or a mixed salad that changes with the seasons. We tend to eat more salads in the summer when our garden is flourishing and I do not think I ever make the same salad twice. I like my salads to have lots of color, texture, and of course they also must taste great too. This hearty salad is a surprise in every bite from the sweet crunchy nectarine, to the tender black beans. Although I will give an exact list of ingredients, feel free to add or subtract and change anything you wish depending on what you have on hand or prefer. The only important thing to remember that you should dice your ingredients fairly small so they do not overpower the beans and quinoa. If you are not familiar with it, quinoa is a remarkable ingredient and is not a grain, but a seed, so is gluten free. It is also a complete protein containing all 8 essential amino acids and is a good source of iron, phosphorous, magnesium, calcium, vitamin E, and folic acid so you can see why some consider it a superfood and why it is becoming more and more popular. Although quinoa is not easily found in Italy, I have recently discovered it being sold at local health food stores, as well as in the organic and health section of larger grocery stores. 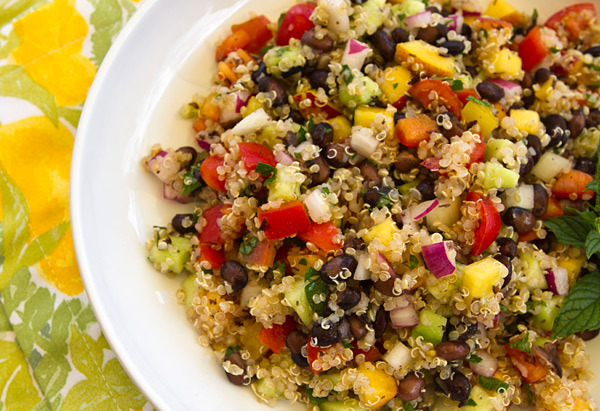 Quinoa can be found in many colors now, though I prefer the regular beige colored quinoa for salads such as this one. 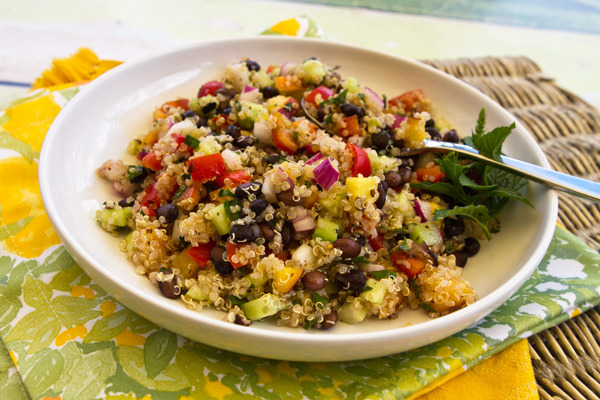 This is a great summer salad to take on picnics as it is a complete meal in a bowl. It is also a good choice for dinner on those hot summer days when you do not feel like cooking as you can prepare the salad in the morning when it is cooler, and then refrigerate it until you need to serve it for dinner. Quinoa (aka Super Seed) is a gluten free seed that provides a complete protein as well as iron, phosphorous, magnesium, calcium, vitamin E, and folic acid. Black beans are high in fiber and a good source of low fat protein. Nectarines are low in calories and are naturally fat free, contain vitamin C and A which helps to maintain a healthy immune system. Nectarines are also a great source of antioxidants which can help protect the skin from damaging UV rays by counteracting free radical activity. In a saucepan, combine the quinoa with 2 cups of water and a pinch of salt and bring to a boil. Cover the pot, and reduce the heat to simmer and cook until all the liquid has been absorbed, about 15 minutes. Spread the quinoa out on a plate and allow to cool. 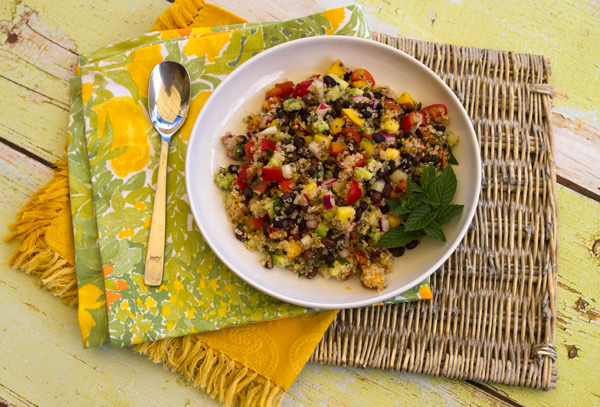 Once cooled, mix together the quinoa, beans, and the rest of the ingredients in a large bowl and toss gently to mix. In a small bowl, whisk together the lemon juice and 1/3 cup of olive oil. Taste, and add additional olive oil as needed.